The parsonage is a short walk away from the high street, and the Brontёs were clearly at the heart of village life. Now a celebrated tourist attraction, in the mid-19th century Haworth was a busy industrial town. The Reverend Patrick Brontё was head of the family and an acknowledged leader in the wider community, and not just in the religious sphere. Though politically conservative, he was deeply involved in his parishioners’ lives and campaigned tirelessly for better conditions. Most of Haworth’s residents were humble labourers, and even the relatively comfortable Brontёs knew hardship and suffering. Their mother died when they were still young, and the eldest daughters died while at boarding school. Of the surviving children, only Charlotte would live beyond thirty. Ultimately, Patrick would be left in the unenviable position of outlasting his entire family. It is curious to think that this family home is now open to the public, considering that the Brontёs were apparently so closely attuned to each other and the desolate moors that surrounded them. At the dawn of the 21st century, it seems ever more challenging to take the time and space to create separate, imaginary worlds, as the Brontёs did from early childhood. Even more remarkable is that the four siblings worked together to invent a new literary landscape, but were still able to develop their own distinctive voices. ‘I can’t imagine writing/at the same table as my sisters.’ Katrina Naomi begins her collection with ‘The Extra Brontё’, and ruminates on ‘that claustrophobia of ink’. ‘And whose fine story would I have stolen…?’ she adds mischievously. Writing is often associated with isolation, but creativity can be sparked anywhere. How many novels and poems have been written on living room sofas, kitchen tables, or noisy commuter trains? Anne’s last letters reveal a strength of character based on spiritual convictions that seem out of place in today’s largely secular Britain. ‘I have no horror of death she writes,/God’s will be done. I have no religion and want to live’, Katrina Naomi adds, strong in her own defiance as Anne was in resignation. ‘Anne is my favourite,’ she admits. Of the three sisters, Anne’s work is probably the most underrated. More easy-going than Charlotte, more affable than Emily, Anne produced two highly realistic, brave novels (Agnes Grey and The Tenant of Wildfell Hall), drawing on her own long tenure as a governess. Her poems reflect her devout faith, which reassured her through terminal illness. Anne was also the only family member to be buried outside Haworth: in her final days, she was taken to Scarborough to see the ocean once more, and there she died. Some of the items on display have transformed in purpose from utilitarian to the almost fetishist, as the title poem, ‘Charlotte Brontё’s Corset.’ ‘I feel like a tabloid reporter,’ Naomi admits, ‘sniffing around the armholes of your life.’ She then recalls a black PVC corset she owned in her late teens. The corset, once hidden from view, has now become symbolic of a bolder kind of femininity. Naomi’s wicked sense of humour prevents her tribute from becoming too reverential. There has sometimes been a tendency to see the Brontёs as delicate, fey creatures, struck by genius, rather than the intelligent and determined writers that they must have been. In ‘Overnighter at the Brontё Parsonage Museum’, Naomi imagines herself living there as the Brontёs did. ‘There’s no Cathy at the window’ she reports, ‘and I dream of bad-boy Branwell’. Here Naomi touches once again on ‘the Brontё myth’, combining the fictional ghost at the window from Emily’s Wuthering Heights with her brother Branwell’s real life dissipation. 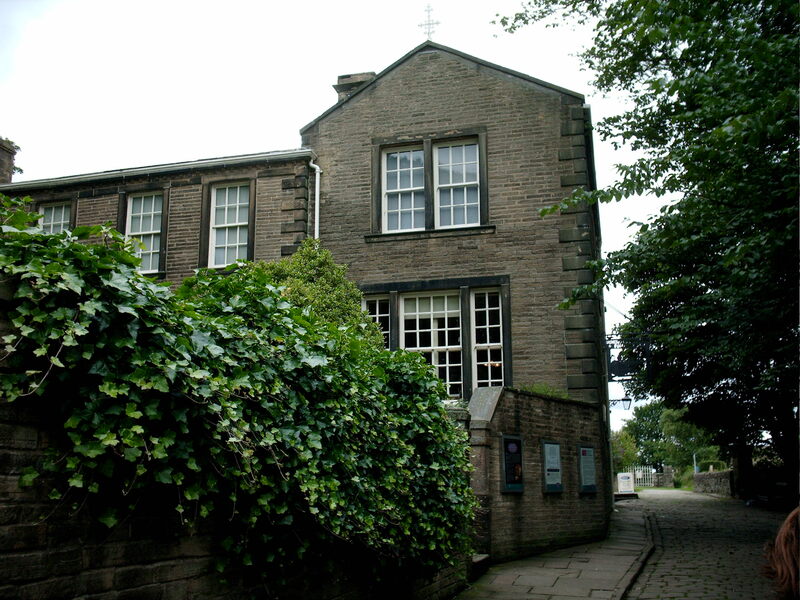 Branwell’s rebellious spirit and unfulfilled ambitions still haunt the museum, alongside his famous sisters. As the only son, Branwell was the focus of his father’s greatest hopes. A portrait artist and would-be writer, Branwell was allowed greater freedom than the others, but never found any measurable success, or contentment. In ‘Bertha’, Naomi turns to one of Charlotte’s creations, Rochester’s first wife from Jane Eyre. In Charlotte’s novel, Bertha was a shadowy figure, driven to madness and hidden in an attic. Ever since Jean Rhys published Wide Sargasso Sea in 1966, Bertha’s character has been given new life. ‘Bertha’ appears near the middle of the pamphlet, and in many ways it marks a turning point. From here on, it’s clear that Charlotte Brontё’s Corset is not just about the Brontёs, or even the museum. In this historic setting, Katrina Naomi has been able to map out her own creative force. This line betrays our ever-changing notions of beauty. Charlotte was less than five feet tall, and considered herself very plain. Jane Eyre was not conventionally attractive, and in many ways this makes her more convincing than a traditional romantic heroine. There is a sense in which the astonishing art of the Brontёs can never be fully explained, and I felt sure of this when I visited their home. In every room, on every item of clothing, I searched for answers, and was left with even more questions. ‘Time passes differently when you write,’ Naomi states, in ‘Grandfather Clock.’ She likens the craft of writing to ‘sifting for fool’s gold’, with the ‘three wan faces’ of Branwell’s family portrait looming behind. Charlotte’s first novel was rejected outright, while both Emily and Anne had to rework their manuscripts before they were finally accepted for publication. Even then, Charlotte was the only sister to find fame in her own lifetime. Each item of furniture tells its own story, like the horsehair couch where Emily died. ‘Unlike Keats. she didn’t yearn/to be moved to the window/preferring to stay in the shadows’, Naomi observes. The comparison to John Keats, another great poet, is telling. Of the three sisters, Emily was the finest poet. Like Keats, Emily was inspired by nature, and she also accepted her tragic fate with stoicism. Her only novel, Wuthering Heights, was shocking for its time (all three sisters were initially published under male pseudonyms), and it still divides critics today. Emily was the most reticent of the Brontёs, and her thoughts can only be guessed at. In ‘Die Kϋche, das Bröt’, Naomi imagines Emily practising her German while cooking, another favourite pastime. ‘Only now can I begin/to learn the Wärme of her words,’ the poem ends. While Emily is often portrayed as ‘the sphinx of English literature’, and was undoubtedly a loner, personal accounts indicate that she was also a pragmatic, hardy young woman, who effectively became the family housekeeper after their beloved Aunt Branwell died. The blurring of the Brontёs and their art becomes clear in a later poem, ‘On the Arrival of Emily’s Painting Box from Sotheby’s to the Brontё Parsonage Museum.’ The artists’ set was acquired at auction earlier this year for £37,000. There is a certain irony in so much effort being made to return an item to its rightful home. Though the Brontёs are long gone, their memory lives on through our modern cult of celebrity. ‘I walk on through from public/to private, from flagstones to stained lino,’ Naomi tells us, capturing the mundane, not-so-glamorous daily routine of life at the museum. Charlotte’s Spanish veil ‘hangs like a medusa, funereal’, Naomi observes, linking this exotic item to death, a constant presence in the Brontё home. Yet, as with Charlotte’s corset, the veil seems somehow incongruous. After her sisters died, and their true identities were revealed, Charlotte tried to preserve their reputations in the way she knew best, by emphasising their unimpeachable respectability. Emily and Anne were innocent, unworldly young women like herself, Charlotte insisted, and any offence caused by their provocative writings was unintended. Indeed, Emily and Anne were both spinsters, and Charlotte would later die in pregnancy, just months after her wedding to the local curate. But despite appearances, and despite their brief, largely uneventful lives, all of the Brontё women were rich in imagination and, in their own way, strikingly passionate. ‘Who would study curling tongs,’ Naomi notes wryly, ‘when there’s/Brontё letters, poems and manuscripts?’ But these unremarkable household items add a more human dimension to our perceptions of this much-mythologised family. The Brontё sisters were not passive vessels, placed on earth for visionary purposes, but skilled, resourceful craftswomen who, through their body of work, irrevocably changed our view of the world, and their influence is still felt by writers today, as Katrina Naomi proves amply in this fascinating collection. You have written one of the best commentaries I have read on any blog. I read all the Brontёs’ during my emotionally hightened teen years and fell in love with each, one by one. If I have a streak of romanticism, if a tear steals down my cheek today, it is because of those books read then. Wuthering Heights I have read and re-read because… because… now you have planted the desire to re-read Agnes Grey. That, I remember, was deeply affecting. I wonder what it will be like looking back, a man of sixty reading a novel essentially written for a person looking forward. Will it prove too painful? The unfulfilled dreams, the lost opportunities, the momentary nature of unalloyed love? Thank you anyway for reminding me. And for your recommendation. Lastly, of course, good luck with your writing. Bound to be a success if as good as this. My name is Saso and I start my website about vinyl corset. I stumbled on your site, and find that i must larn a lot about the corsets. Tnx for your writting and I will Reccomend this site to others. I hope is nothing wrong with that. I just come across this site, and must leave a comment on. You did the great job, and give us plenty of material.